I hang my head to admit this, but I think I got the idea for tonight’s dinner off of Rachel Ray…but I just tried googling the recipe and can’t find it…so maybe I’m making that up?? Whatever. I used a veggie peeler to shave ribbons of carrots and zucchini for tonight’s dinner. I parboiled the ribbons (dunked them in boiling water for about 2 minutes), let them drain, then topped them with 2 fresh burrattas (1 for each adult). 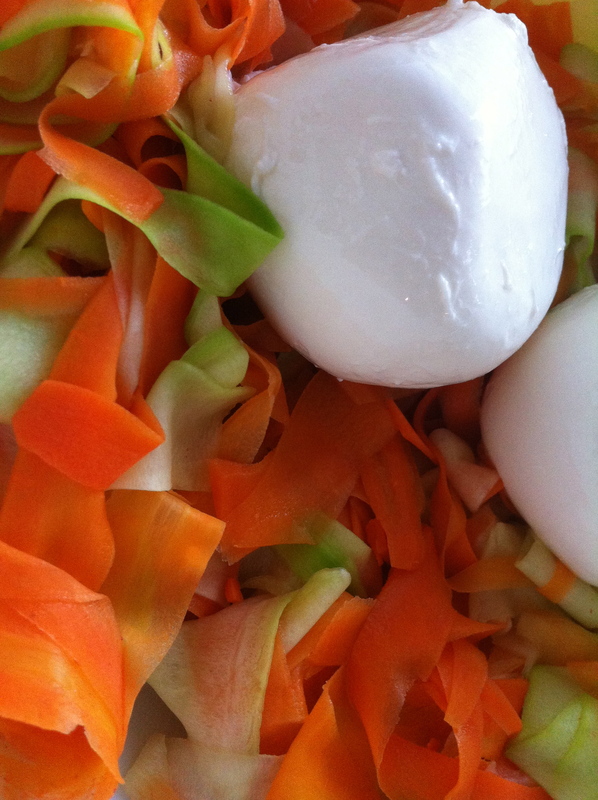 A Burrata, in case you didn’t know already, is like a mozzarella purse with fresh curds inside. Otherwise known as PURE DAIRY JOY. Once you slice (or bite) through the outer ‘shell’ of mozzarella, the interior just oooooooooozes out. A good burratta will make you stop in your tracks, make you drool a little and perhaps questions some of your life choices. 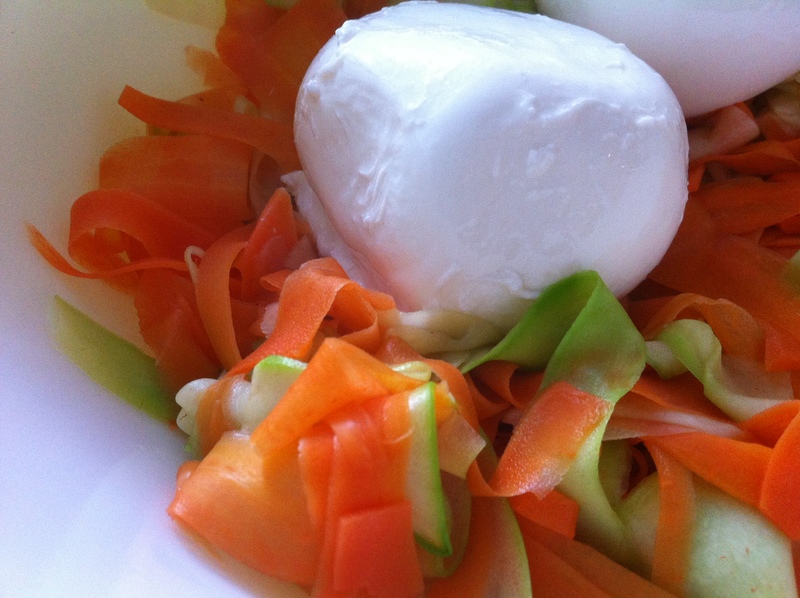 1 Burrata per Adult **I used 2 medium sized Bel Gioioso burratas that came in a single container. If you’re freakin’ LUCKY enough to live near a source of FRESH burratas – YOU are a very very very lucky human being. Pre-slicing. Don’t the ribbons look so pretty? 1- Fill a pot with salted water and bring to a boil. 2- While itsa gettin’ hot, use your veggie peeler to peel the veg. Discard the peels. Trim the tops & bottoms off and also discard. Now you have cylinders of veggies. Hold one veggie in one hand and using the peeler in the other, peel it without turning. After two or so the ribbons you’re slicing off will start looking wider and more well, ribbon-like. I tend to get about halfway down into a carrot before flipping it over and peeling the second (rounded) side into the middle (flat). Also, I usually set aside the very middles of the veggies (I use for snacking purposes…or for toddler sword fights. Those are amusing). I set them aside because I don’t want the zucchini seeds in the dish… and I can never figure out how to shave the middle of the carrots down without nicking some part of my hand. 3- Let the veggies sit in a colander for a few minutes to drain any excess liquids. 4- Get your serving dish out and make sure the table is set – because this will literally take three minutes from the time you dump the veg into the boiling water til you should be eating. 5- When you’re ready, dump your veg into the water and set a quick timer – or just count for 2 minutes. You can either fish out the veg with a slotted spoon or drain using a colander. Up to you. Make sure you shake the colander VERY WELL – there will be a lot of residual liquid. 6- Top with your Balls O’ Dairy Joy (the burratas) and SERVE SERVE SERVE! 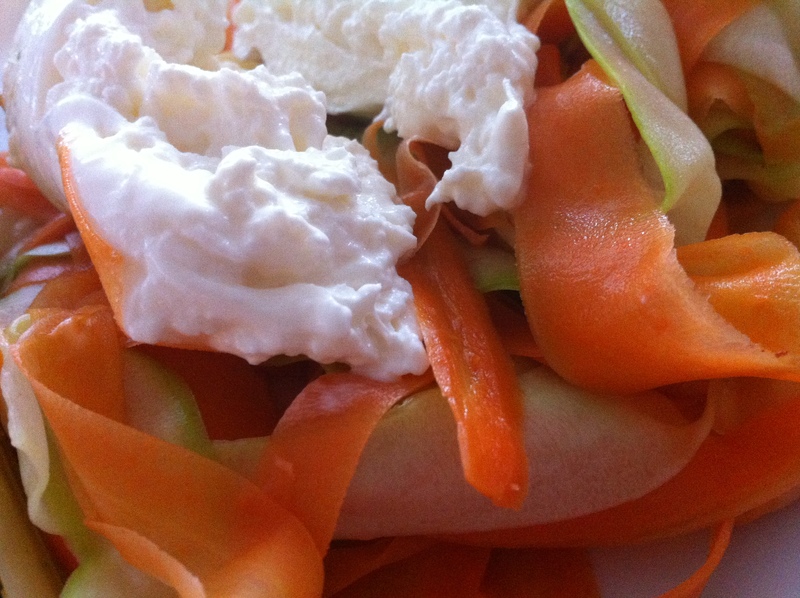 As you slice into your burratta the middle should ooze and melt happily into your ribbons. I like mine with a few cranks of fresh pepper. C thought it perfect as it was. 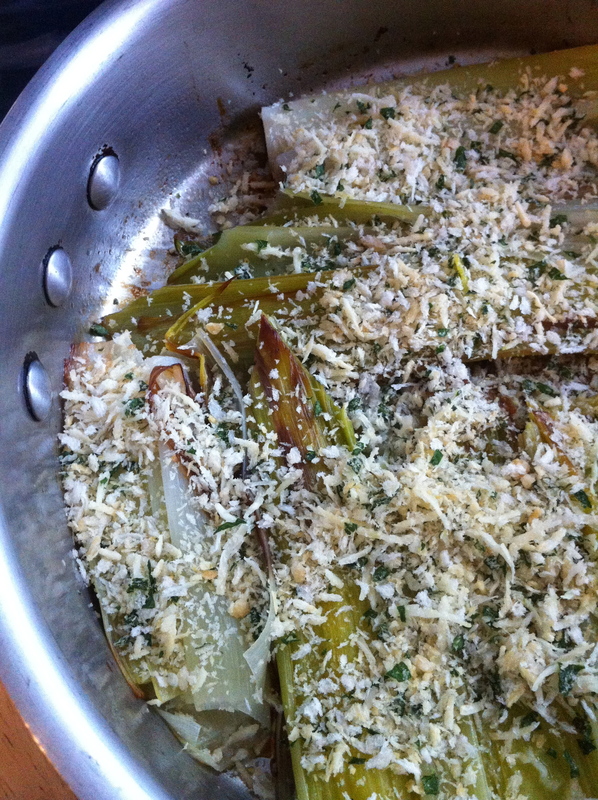 We love leeks. LOVE them! I served them with Butter Braised Leeks with Crispy Panko Topping (the link to the original posting with recipe is HERE). Tonight I included the lemon juice and the parmesan that I forgot/didn’t use last time. End result? C literally scraped the goodness from the bottom of the pan with his fingers. He might have used his fingernails a little too. Try not to lick the screen please. I loooovvveee burratta! And this looks like such an easy and healthy way to serve it — I’m totally trying that out this summer! Jaime and I saw the veggie ribbons on tv. They were used as a salad with a vinaigrette dressing. Like your version as well.